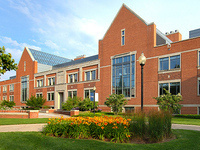 Our faculty, staff and coursework are based in Van Zoeren Hall. However, your studies, fieldwork, internships and research might take you through campus, into the community, across the country and around the world. Our program is designed to give you hands-on, real-world experience. In the spirit of studying human behavior, it’s important that education extends beyond the classroom — and even the campus — to experience how and where others live. As a social work major, that means 400+ hours in the field. As a sociology major with a criminal justice emphasis, you’re required to spend time off-campus and intern in Chicago. All majors are encouraged to pursue off-campus study opportunities. The Frost Research Center is Hope’s center for survey research and data mining, providing services to our campus and community.